Giddy we scurried down the jetway with seat assignments to Fiumicino, on our way to celebrate New Year’s Eve abroad. Prior to the familiar airbus zig zag napping shape, the flight attendant walked past selling ear buds for inflight entertainment. My coworker inquired if free for airline employees, causing the attendant to respond defensively. My friend cleared the air in the galley returning with ear buds, nips of holiday cheer and an Italian attendant telling us some good news. He said we could share the crew shuttle and use his hotel room, which he would not need. Assuming he was kidding, I put in my personal ear buds and eased into a dreamy place. One of my favorite spaces to be, is anticipating waking in the magic of visiting a new country. It felt like minutes later we were grinning ear to ear, mimosas in hand as Italian sunlight fell upon us through the windows of the shuttle. We arrived at the chic hotel, and in our fog of elation were given a free room key. It took a few Italian moments to figure out how to turn the lights on. The room key had to be inserted into a slot in the wall, I thought perhaps cash may fall out and we would be on TV. The room, brightly painted came with a flat screen, fluffy down comforters, a towel warming rack and a bidet that took all curiosity. We hit the cobblestone, beginning our exploration meandered down streets surrounded by historic buildings, and large trees, surreal like a Hollywood set. We gazed at enclosed seating arrangements that would house special New Year’s Eve dinners with beautiful table settings and chilled bottles of vino. Our soles followed white lights hanging above narrow corridors. We ordered snacks from a high countertop cafe with foreign currency and attempted Italian. Walking for hours we viewed the coliseum from various angles, getting lost repeatedly. However without a plan perhaps we were never really lost. We ordered gelato and refreshments for our exploratory traveling pallets. The sun was setting as our legs began to ache. Deciphering the local map we made our way toward the Vatican. The nativity scene was breathtaking, eyes fell upon majestic horses as the sound of hooves echoed off buildings, like a movie score. As if hungry pigeons, we followed the crowd through a metal detector and received a flyer which read: BENEDETTO XVI on it. Onlookers wailed and shot pictures like paparazzi. 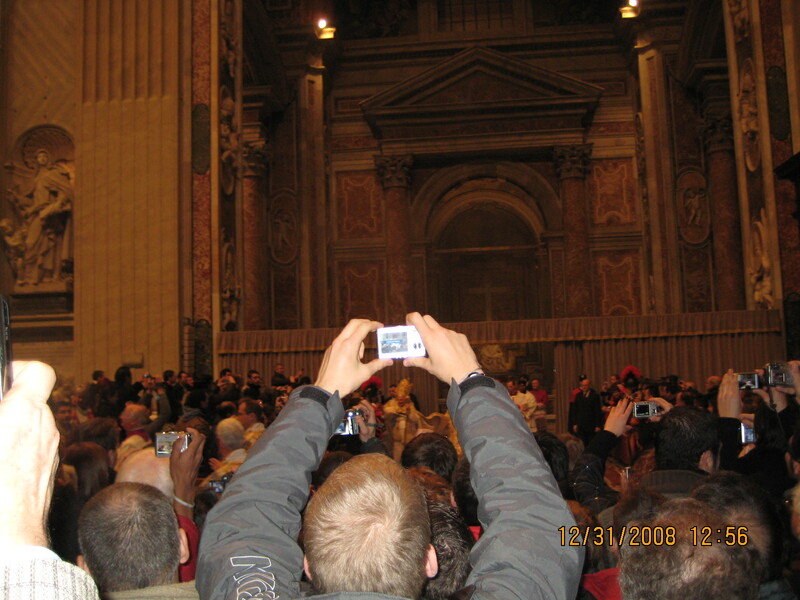 Our focus transferred from our weary legs to the Pope himself, as he appeared from behind a curtain. Jaws dropped, my camera elevated toward heaven capturing him, between the arms of another man…well that sounds strange, please see above picture for clarification…The processional stunned me to think of where we were actually standing. Mass began, soon our legs were done, frozen in fatigue as we read each others minds and exited the building. We searched for an authentic Italian dinner to celebrate, unfortunately our pasta plates were not that exciting, giving my friend sleepy head syndrome at the dinner table. It made me giggle.